Halifax, NS – Organizers of the Queer Acts Theatre Festival, running from July 13-17, are proud to announce that LGBTQ+ youth 20 years of age and under will be offered free rush tickets to performances at the 2016 Queer Acts Theatre Festival. Queer Acts calls these free tickets for youth, Fierce Freebies. In the minutes preceding every 2016 Queer Acts production, LGBTQ+ identified youth aged 20 years of age and under may claim unsold tickets at the Bus Stop Theatre box office, allowing them entry free of charge. The goal of this new initiative is to increase queer youth’s ability to access LGBTQ+ theatrical performance. Fierce Freebies are made possible through the support of Admiral Insurance. Fierce Freebies will be limited to the unsold portion of tickets prior to any show. Audience members of all ages still have the opportunity to purchase advance tickets through Ticket Halifax or during the festival at the Bus Stop Theatre box office. Tickets are $12 for students, seniors, & underwaged, or $15 regular. Service fees extra for online orders. Some of the highlights of the 8th annual Queer Acts Theatre Festival include 22 Minutes alumnus and host of CBC Radio 1’s Because News, Gavin Crawford, with his hysterical one-person show, “Friend” “Like” #Me. From Alberta, Theatre Outré will bring an over-the-top sensory explosion, Castrai: An Electro Drag Opera. And locally, Queer Acts welcomes the sequel to the 2015 Atlantic Fringe Hit, Rolling Bold Productions’ collective creation Sit on my Face, again, the res-Erection. 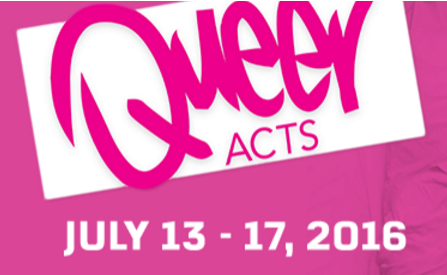 The Queer Acts Theatre Festival festival runs from Wednesday, July 13th to Sunday, July 17th, with performances every evening. Fierce Freebies - Rush tickets for LGBTQ+ youth 20 years of age and under - FREE! Go to QueerActs.com for tickets and info or The Bus Stop Theatre, 2203 Gottingen St.